I’m an Indonesian, a Liberal Arts student of Northeastern University College of Professional Studies who is dedicating myself to peacekeeping and humanitarian works through United Nations. I want to contribute anything I can to make the world better. 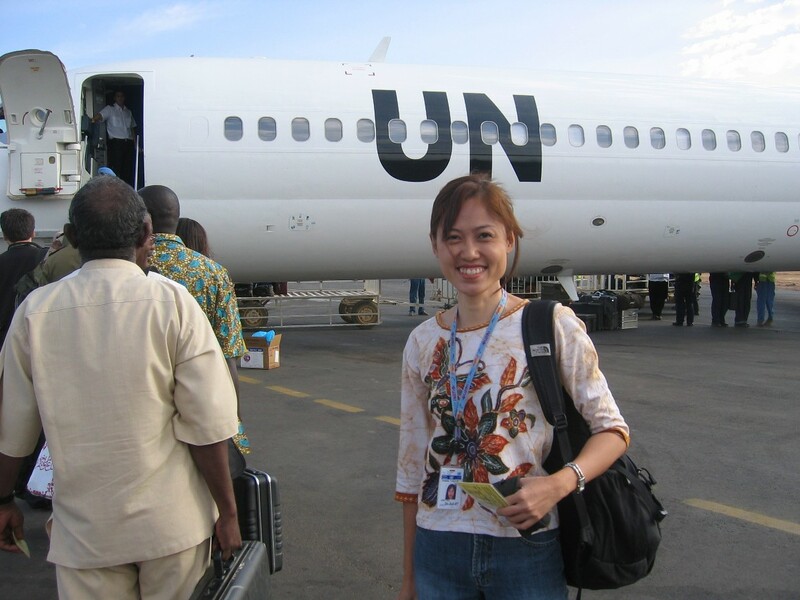 I was serving as a United Nations Volunteer with the UN peacekeeping operations in Afghanistan, East Timor, Sudan, & South Sudan. I was also part of the Aceh & Nias Tsunami Recovery Relief team with UN OCHA, Aceh Local Election Support Project with UNDP, & the Earthquake Early Recovery Relief with OCHA in Yogyakarta, Indonesia. I’m now working with the United Nations Office of Administration of Justice in New York. Prior to that, I was part of the United Nations Development Programme (UNDP) Bureau of Management, United Nations Millennium Campaign, United Nations Civilian Capacity Project & Education Outreach of the United Nations Department of Public Information. I love traveling, photography, & culinary adventure! I would like to take you to travel vicariously through me… To see what I see, to learn what I learn, from my experience visiting new places and learning new cultures. All materials on this website Copyright © 2009-16 Imelda Tjahja, all rights reserved. on March 3, 2011 at 6:26 am Alyse L.
I discovered your blog site on google and checked a few of your early posts. Continue to keep up the very good site/blog. Hey, buddy, your blog design is simple and clean, like me. Your blog posts are very high. Please keep them coming. Congratulations! I thoroughly enjoyed reading your article and the comments on here even though it took quite some time. I love discussing this topic so your blog is somewhere I will probably spend a lot of time from now on. Imeee…..blogwalking on your pages, then read the stories, it took back my teenage dreams!I really wanted to be a journalist… writing, travelling and photography, are the things that i love! I was very interested to report the live events, including from the conflict areas…it’s very challenging! I hope I travel with you one day! Two huskies and a passport! Imeee…..blogwalking on your pages, then read the stories, it took back my teenage dreams! I really wanted to be a journalist… writing, travelling and photography, are the things that i love! I was very interested to report the live events, including from the conflict areas…it’s very challenging! Salam semangat dari mahasiswa STKS Bandung (Bandung College of Social Welfare) majoring on Social Work. Awesome blog so interesting i need to read all of it when i have time i only just start. Great job keep us posted. Hey, I took that picture at the Melting Pot. 🙂 Nice blog. keep the good work going, I wish your dream come true sooner. Good luck!